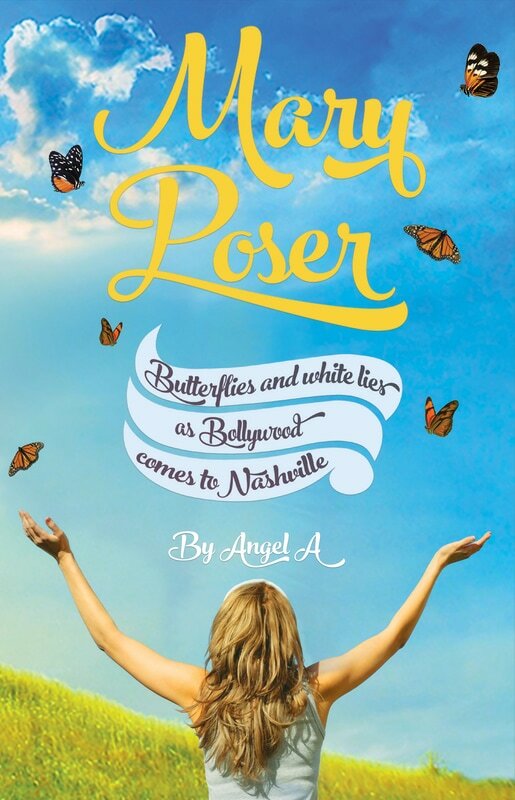 Book Review: Mary Poser by Angel A. So, I’m back with a book review! I’ve been busy with editing projects (SO exciting, I will share! ), and I just can’t manage to find the time to edit AND blog at the same time. I have to trade off. In a modest bowl of Nashville, gently place a girl who is Country music, Bible belt, and a steakhouse foodie. Then add a surprise portion of exotic and handsome Anglo Indian to the container who is a passionate Bollywood director, vegetarian and Hindu. Stir vigorously on a bed of intense attraction. At first, the ingredients will seem to clash and separate. Include a dollop of jealous boyfriend and a meddling mother. Splash in a serving of fun and mischievous friends. Add a dash of crazy aunt and a minister father to keep the flavors working together. Sprinkle in even more complicated family members to taste. Cook on high emotions. To be honest, I don’t love the description and I’m not sure I would have picked it up to read had I not received an invitation directly from NetGalley, which I had been wanting to join. Now, if you’re a regular reader here you know I don’t review books I don’t like, so you know the book had to be better than the description indicates or I wouldn’t be posting this at all. And it’s true – I’m really glad I got past the sort of silly description and read the book! Some my favorite parts of the book, because they taught me the most, were the parts where the aforementioned Anglo Indian, Simha Das, explains his Hindu beliefs to Mary Poser, the Nashville girl. Knowing virtually nothing about Hinduism, I found a surprising amount of commonalities with Catholic Christianity. Even more interestingly to me, the things I found common to Catholicism were often the things Mary found most unlike her Baptist faith (particularly in the realm of sexuality). The book is full of references to common stereotypes and prejudices. I’m not sure whether it makes the story more or less believable that Mary’s family manages to deal with all the hot-button issues: race, sexuality, religious beliefs. Mrs. Poser, Mary’s mother, is the character who embodies the majority of the unsavory behavior. She is a stereotype, while believing and perpetuating every stereotype about anyone unlike her. She’s pretty much insufferable, and though she comes around at the end I find her redemption a little too convenient. Mary’s personal journey forms the basis of the story and is the most compelling part of the book. It has a very powerful metaphor in Mary’s inability to cross a particular bridge, and is full of lots of insights about a young girl trying to figure out who she is and how to find her own way in the world. While the outward issue is that Mary falls in love with an Indian Hindu man in Nashville (the horror! ), Mary’s inner dialogue reveals her struggle with mental illness, particularly anxiety and self-harm. She feels she has a role to fulfil in life and struggles to allow herself the freedom to break out of the mold her upbringing has forced her into. The author, I think, does a superb job of illuminating the inner workings of an anxious mind through telling the story from Mary’s point of view. My only grievance is that I’m not satisfied with the resolution. While Mary has moments of clarity, she seems unable to actually recognize her anxiety issues (for example, she chafes at being prescribed medication for anxiety when she sees a doctor for recurring stomach issues); similarly, I feel the self-harm (specifically, cutting) issue is inadequately resolved and not given the weight it deserves. One thing that sticks with me all these months later (that I didn’t have to reread my Kindle notes to remember) is a discussion Mary and Simha have about using the term “busy” as cover for “unhappy” when asked how one is doing – as in, “How have you been?” “Oh, you know… busy” – because “busy” seems important. I don’t think it’s an expression I’m guilty of using in that context, but it has caused me to reevaluate what it is that I’m “too busy” for, to make sure those things that truly matter don’t get lost. So, check it out! Info about the book and the forthcoming movie can be found at maryposer.com. Thank you to the publisher for providing a copy free of charge via NetGalley in exchange for an honest review!